"The 3D moving map uses real satellite imagery which allows passengers to select from a variety of customizable perspectives including information on altitude, speed and travel time", Lufthansa Technik said. 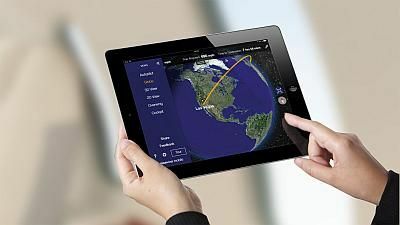 With "niceview Mobile" Lufthansa Technik will offer a mobile moving map system as part of most Inflight Entertainment Systems (IFE). "niceview Mobile" can run on iOS and Android devices, according to the company. "Until now, this level of directly experiencing one's own flight was only available in the cabins of VIP aircraft in certain specially equipped seats", explains Andreas Pfister, lead project manager for the Original Equipment Innovation division at Lufthansa Technik. "Now passengers can take the fascination of flying into their own hands. Time after time, it is a very special feeling, even for us developers." "niceview Mobile" can be integrated in standard inflight entertainment systems and flight guests can access it through the on-board WiFi.